If the network is slowed down, your access could be seriously affected, which could impact various aspects of your day-to-day life, including searching the Web, using your smartphone, and using any other device that may be connected to your network. If you are considering the IP camera bandwidth consumption, and wondering whether IP cameras slow down your network, you can spend a few minutes checking out this article. Do IP Cameras Slow Down Internet Speed? I was thinking about IP traffic on my home network and wondering if I’d overwhelm it with traffic from my cameras. IP camera internet usage is one thing that you will certainly consider before installing a security camera. Do WiFi cameras slow down Internet? While yes, the IP cameras, including wireless security cameras and the wired ones, may slow down your network a bit, but the impact is not as much as you may think. In fact, the wireless security camera will NOT slow down the Internet if you are not remotely accessing the cameras via phone, PC or other devices – the impact is so small that could be ignored. And the technology is always advancing, which means that IP cameras are becoming more adaptable to networks, and thus having less of an impact on them. For example, the H.265 and H.264 cameras compress the recording files to smaller size, and the battery powered cameras which use bandwidth only when motion is detected. Compression. It’s a major cause of your WiFi security camera data usage. MJPEG/MJPEG-4 and H.264 are the two most popular compression standard in the video surveillance and security industry. Camera resolution. A camera that offers higher resolution will require more bandwidth, which requires more storage, and will thus slow down your network. Say, a 5MP camera will definitely need more bandwidth than a 2MP or even 4MP IP security camera does. FPS (Frame Rate per Second). The frame rate determines the quality your CCTV surveillance footage. The more FPS, the better videos. FPS also has influence on the data of your CCTV streaming uses. Number of IP cameras. The more cameras installed in your home, the more data your security system will use. How much data does a WiFi security camera use exactly? If you are having trouble finding all the necessary information required, you may check this post for detailed instructions about IP camera bandwidth calculation. Also, you can use online tools, such as the IP camera bandwidth calculator, to see the internet speed requirement for your IP cameras to work, and get normal video streaming. If you are concerned that an IP camera will load down your home network, here’s a look at some things that you can do to reduce the amount of bandwidth it will use. Right off the bat, you should familiarize yourself with the settings of your IP camera and opt for a compression format that will best suit your specific needs. For example, if you want to increase your storage, an H.264 format may be a good option for you, as this will reduce the amount of storage space your IP camera requires, and will thus save the IP camera Internet usage. Of course, you don’t want to compromise security when choosing a camera. Before opting for a lower resolution camera, make sure that you take into consideration the area that you are monitoring. For example, if you are monitoring a larger area, such as a parking lot, higher resolution may be necessary; however, if you are only using the camera to monitor a small space, such as a door or a hallway, opting for a camera that will capture the detail you need at a lower resolution is a wise idea to avoid unnecessary strain on your network bandwidth. Lowering the frames the IP camera catches per second can also help to avoid unnecessary strain on your network, which will help to avoid slowing it down. While it may be nice to capture a high amount of frames per second, doing so will have a major impact on the speed of your network; generally, capturing 15 frames per second is more than enough to effectively monitor your home and will show you everything you need in order to capture evidence of criminal activity. 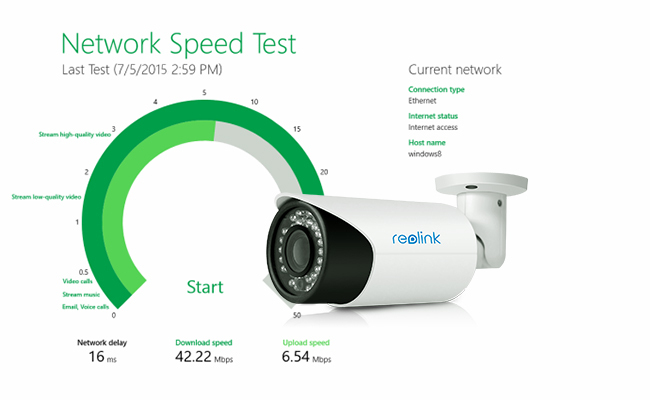 Does an IP camera use bandwidth all the time? Some security cameras, usually the battery powered ones, only wake up when motion is detected, and thus they will not use the network all the time, saving your home bandwidth. Having the camera stream live video when nothing is occurring is unnecessary and will slow down your network. If you opt for motion based recording, the camera will only kick on when it detects motion, which will reduce the amount of data and storage is uses, so it won’t lag your connection to the Internet. However setting your camera to motion detection mode could be a little different. The cameras will still stream videos and use bandwidth all the time, and that’s why they can do pre-recording. If the above methods fail to deal with the laggy IP camera network, perhaps the most reassuring way is to separate IP camera system from the network. You can use a two router system to take all of the traffic from the wireless IP cams off the main router and isolate them to the secondary router. Then have the server, PC for example, be connected to the secondary router for recording and remote access. And keep all of the gaming and network systems connected to the main router. Or you may purchase an unmanaged gigabit switch which will provide very good separation between the camera traffic to the recording PC and the rest of the network. A security camera system will not slow down your network – actually it will have zero impact on your home network – as long as you don’t need remote viewing. That’s because the Internet cameras and NVR recorder will automatically set up its own proprietary network and start to communicate with each other without connecting to your router and slowing down the network. Want remote viewing and push notifications to your phone but afraid of the possible network stress? You can perfectly handle that with a 4G camera. Take a look at these low bandwidth security cameras, and you will be less troubled by the IP camera bandwidth consumption issue. 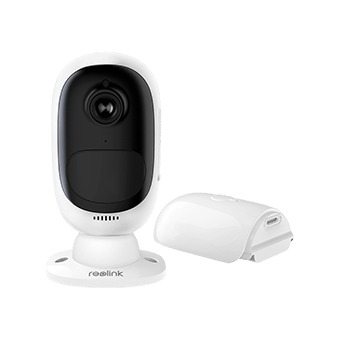 This rechargeable battery powered wireless security camera only uses your home network when motion is detected and when you remotely access the camera, so you don’t need to worry that the camera will stress your network bandwidth. Featured in top media, including TechRadar, PC Magazine, Digital Trends, MakeUseOf, ZDNet, Android Police, etc. 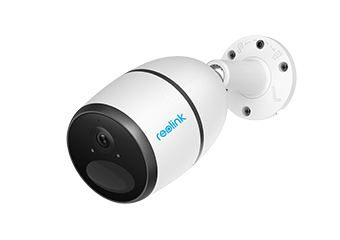 If you worry that the WiFi security camera will slow down the network anyway and want the wireless design, then the 4G LTE camera Reolink Go would be no mistake. Running on its own 3G/4G cellular data, the camera will have NO impact on your home network. Featured in top media, including Digital Trends, TechRadar, Stuff, PCWorld, Engadget, SmartDroid, etc. for its convenience. This entry was posted in Home Security FAQs and tagged cctv bandwidth usage, data consumption, network speed. I would have to disagree on your last point, unless you are talking about programming within the camera internally. Any camera is always streaming to the NVR…regardless of whether motion detection is activated. The NVR is recording everything but only saving motion files(kind of like marking the file). This is how you can get pre-recorded motion. Otherwise this would not be possible. How else would a system know to have an extra 10 seconds pre-recorded before a motion event happens? Now if there is a specific setup within the ip cameras internal menu that can disable streaming yet reactivate it to an NVR with a pre-record setting activated…it would have to have an internal sd card. And I have not seen a camera with that type of programming. In essence the camera must always stream and the nvr must constantly record…but what it saves is based on the motion detection algorithm you have programmed. My experience…current computer technician but Camera installer for 10 plus years…switched to all high def in the last 5 years. I would love to hear a counterpoint..perhaps I missed something. Hi Dave, thank you for sharing your ideas with us! What you mentioned here is true and very professional in regards of the NVR security camera system. Well, that could be a little different when it comes to the standalone security cameras (without SD card) which are popluar on the market actually. Usually, they couldn’t do the pre-recording, and therefore they will only record and consume your network bandwidth when motion is detected if you set them to the motion detection mode.